Funny Ha Ha… Coffee and Donuts Anyone? Can you guess what the challenge was this week at Crazy 4 Challenges? Yep, make a funny card or project! I hadn’t used the Tim Holtz Snarky Stickers from the November Simon Says Stamp kit so I chose one that worked with some stamps I have. Some of the stickers will be hard to come up with images to use with them but this one was easy! I used the Hot Cocoa die set from My Favorite Things and the donut dies from Reverse Confetti. 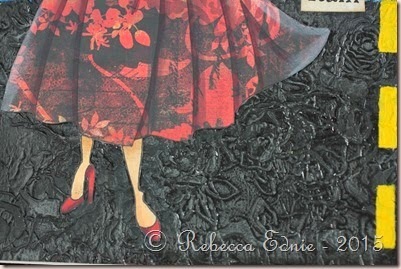 I paper pieced both with paper from Prima. I love using such pretty papers. I’ve been drawn to more clean and simple cards lately, not sure why. But I will always come back to my signature Simple Shabby style eventually! I added a tiny bit of Vintage Photo to the edges of the die cuts just to give them a little definition. It helped them stand out from the patterned background. I thought using the cork pattern for the donut was really fun! The heart ‘sprinkles’ were cut from white cardstock I coated with a gold paint pen. I didn’t this time but I do save my scraps of fancy mirror or metallic cardstocks to use for tiny die cuts like these. The border was cut from another sheet of patterned paper which worked perfectly here. I also made a ‘table’ of sorts for the mug and donut by sponging some grey ink on one side of a mask made from post it tape. Then I added a few sequins to finish it off. The one in the lower right corner that looks too pink is actually blush but the iridescence makes it look brighter than it really is. I love this sentiment! I don’t actually drink coffee but I think I could substitute my morning OJ! 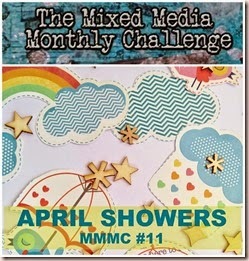 Please join us at C4C for this awesome challenge. I love seeing what you create! This week at Crazy 4 Challenges, we were asked to make a one-layer card. This is something I almost never do so it was a true challenge for me. But this huge Prima Princess image which was amazing to colour helped immensely. I deliberately stamped her off to the side because I wanted to add a sentiment to the side. But after colouring her for 3 days, I decided I might like to frame her so I decided to not add a sentiment, card base or any embellishments for now. Which technically means it isn’t a card. But after working on it for three days, no way was a going to make something else for this challenge! 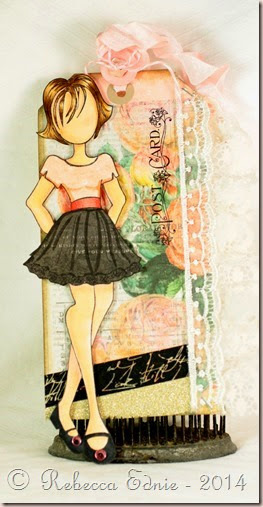 I stamped her in Antique Linen Distress ink then used my professional watercolours (a variety of brands) to paint her. I did also add some Prismacolour Premier and Verithin pencils to add some depth to her hair and to the deep greens between the flowers and leaves. Oh, and a fine-tipped black Copic Multi-liner for her eye lashes. I obviously need a finer one because she looks like she is rocking some serious falsies! Not quite what I had in mind! This is the perfect challenge for a busy time of year. So keep it simple and make an awesome one-layer card. 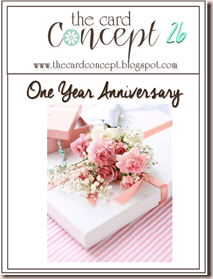 Be sure to pop on over to the blog to link up your creation! And getting caught in the rain? If you’re not into yoga and… Ha! Remember that old song? Once I got this page almost done, I just couldn’t think of any title that worked better! 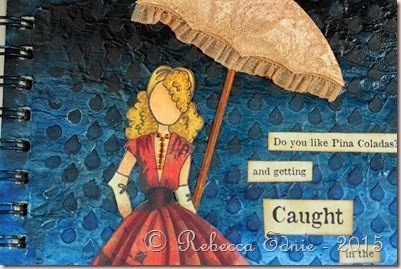 I started with the challenge by The Monthly Mixed Media Challenge: April Showers. 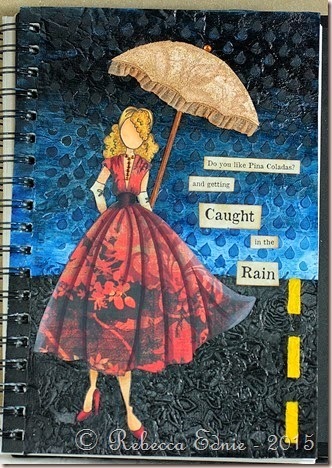 Then the Wednesday prompt for the Simon Says Stamp blog was April Showers and/or May Flowers. So I went to work. First I added crumpled tissue with gel medium then raindrop stencilling to the top of the page and large roses to the bottom. When it came time to add colour, I was a bit stuck. I already made a canvas using another Julie Nutting Doll with a clear blue sky and nice green grass. I didn’t want to repeat that. So I thought of a night sky! I used Golden fluid acrylic paint to cover the page. On the bottom, I added silver rub on metallic paste to the raised areas. You don’t even realize it is there but it makes the road look shiny and highlighted. I coloured and paper pieced my doll. I made my own stencil to make sure that the road lines were the same size and shape. At this point, I realized that this elegant lady probably wouldn’t be out in the rain without an umbrella. and I started thinking of the title. Even if you like getting caught in the rain, you might not want to get wet! Her umbrella is made from white cardstock and lace which I sewed to add the ruffle. Then I sprayed it with Colour Bloom spray. The handle is a bamboo skewer split down the middle and shortened to make it fit better. Her dress is much brighter and more dramatic IRL. For some reason, it looks really washed out. The necklace is made of tiny rhinestones. Finally, I printed the sentiment using a font called Old Newspaper. Since the song is about a personal ad in the paper, I sponged on faded burlap distress ink on the whole piece and vintage photo lightly on the edges. It does look like old newsprint. Here’s the second part of a swap. I posted the first tag HERE. While the other tag was chunky, this one was supposed to be flat. Since most of my embellies are chunky, this was a bit tricky! I’m afraid the right side is a bit blown out. There is a second layer of lace out there that you can’t see very well. For some weird reason, this was hard to photograph. To get the main colours right, the lace disappeared into the background. I should have used something in the background but I’d already mailed it when I realized. 😦 There isn’t too much to really describe. I just collaged lots of fun stuff on there! I’m entering this in the Card Concept Challenge #26. And another Happy Anniversary to the CCC! Yeah, I am so glad I found you. This is my first time even seeing this challenge! 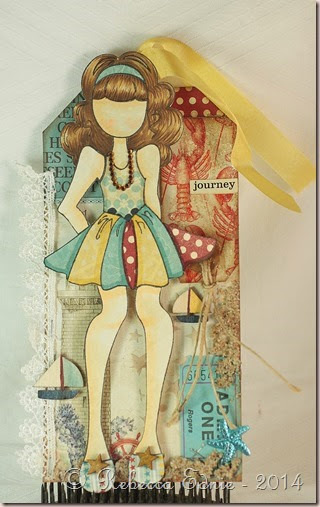 I am in LOVE with these Julie Nutting doll stamps. They take a while to either colour or paper piece but the results are really worth it. I love how the hair turned out on this one. I think I used E53,55,57 and maybe E49 for the very darkest areas. It’s hard to see the very fine detail but the legs are also paper pieced which is why the colour is different from the skin I usually colour. I added Copics for shading that matched the paper’s tone. In case you are wondering, yes, this is a very large stamp. I handmade the tag but it is close to a large standard tag, about 6.5” x 3”. The paper is from an older Webster’s Pages; background (made of several papers), lobster paper (distressed and covered with Rock Candy crackle paint) and the paper piecing papers all come from the paper pack. I carefully cut out the paper around the tag reinforcer so it would show through. The little boats were coloured with Copics too. I messed up the stamping of the feet, I got a double line, so I made the shoes slightly higher to cover that up. The stars are covered with a Wink Of Stella pen. The sand is a product called Mudd Puddles; it’s basically sand in glue in a small jar so you can apply it like molding paste. It doesn’t apply as smoothly but it is fun.